Krabi was one of my first trips when I arrived in the South. I loved everything about it, especially the opportunities to explore anything and everything under the sun. There are countless day trips available to book at the numerous travel agencies and guesthouses ranging from kayaking around Hong Island to Elephant treking in Khao Sok to day trips exploring the neighboring islands of Krabi. I, of course, want to do them all, but time permitting I have had to pick and choose the ones that are at the top of my list. The first time I was down in Krabi I did the 4 Island tour (Chicken Island, Poda Island, Tup Island, and Phranang Cave, Railay) and the 5 Island tour, which is also known as the Hong Island Tour (and not really 5 islands). But there were so many more that I wanted to do! The guide showing me how to tie my knot. By the end of the day, he didn't have to show me anymore! 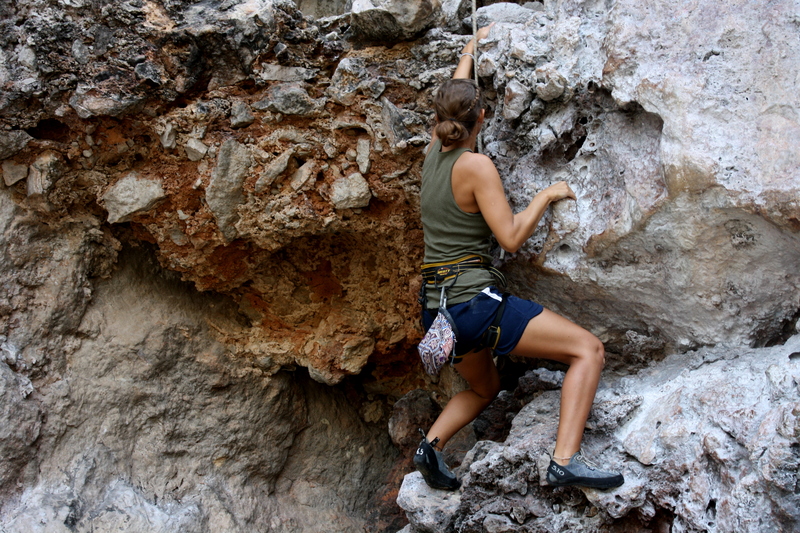 I had heard so much about rock climbing on Railay Beach and I told myself that I would come back and do that before I left Thailand. This weekend I had the opportunity to do just that and it was one of the best experiences I have had! I signed up for the half day trip with King Climbers, which is supposed to be one of the best groups to climb with. I was advised that the half day was more than enough climbing for someone who doesn’t do it everyday and boy am I glad I only did the half day! I ended up being completely beat at the end of the day and sore for days after! This may look like I'm posing, but I can assure you it is "in action"
I also had the option of climbing in the afternoon. Much much better than the morning session, which required me to wake up at 7 in the morning after a long day/night of traveling! I immediately took this option and enjoyed my morning of sleeping in and reading by the river. I was picked up by the King Climbers truck, was taxied over to the Railay Beach peir, and boarded a 15-minute longtail boat ride to Railay. While getting fitted for my climbing gear, I met a fellow Californian (which NEVER happens. I not only rarely meet Americans, but I double rarely meet someone from California! ), Cat, who had been traveling for a couple months in SE Asia. She had just gotten engaged in Cambodia and I begged her to tell me the story! I love hearing engagement stories and hers was a great one! We instantly became friends and vowed that we would take pictures of each other while we were scaling the rocks. Our climbing group consisted of two Norwegians, who had never climbed before, two Californians, and a Finnish guy, Peter, who had climbed in the morning session as well. We began with one of the easiest climbs and I started out with a bang. Peter was blaying me and apparently he wasn’t too ready, because I slipped in the first couple seconds (sweaty palms, I was nervous ok! I haven’t climbed in a long time!) and plummeted the four feet and came inches from smacking into the ground. But I got right back up and scaled that rock! It wasn’t the hardest thing in the world, but it still felt so great to make it up to the top. I haven’t had a challenge like that in a long time and it felt amazing to be “athletic” again! The next one was a different story. The first part was pretty easy, in the sense that it didn’t take me too long to figure out my next foot or hand hold. I was using many of the muscles I haven’t used in ages and it felt so great to “feel the burn” for the first time in months! But then I reached a sort of “impasse.” I kept trying to find a foot hold and then a hand hold and then a different foot hold and then a different hand hold, but nothing seemed to be working. I was only about 6-8 feet away from the top, but I just felt like I couldn’t do it. My arms started shaking and my legs were barely holding me on the mountain. I kept slipping and swinging back and forth and finally came to a point where I yelled down indicating that I was finished. But they didn’t let me down. I heard, “JUST RELAX! !” from one of the Norwegians and “YOU CAN DO IT!” from Cat. “TAKE YOUR TIME” from Peter and “YOU’RE ALMOST THERE!” from the other Norwegian were what I heard right before I decided I was going to make it. I put all my energy and spirit into that rock. I took a deep breath and released all the tension from my shoulders. I stopped focusing on my quivering arms and just told myself I was going to do it and soon enough I made it to the top. When I landed on the ground, everyone was cheering and clapping, and through an exhausted inhale I thanked them for getting me to the top. I couldn’t have done it without the support of four complete strangers. And that’s what traveling is all about. Making relationships with people from different countries that you’ll probably never see again. But that doesn’t matter because for those few moments you spend with them, they’re you’re best friend and they’re all you need. 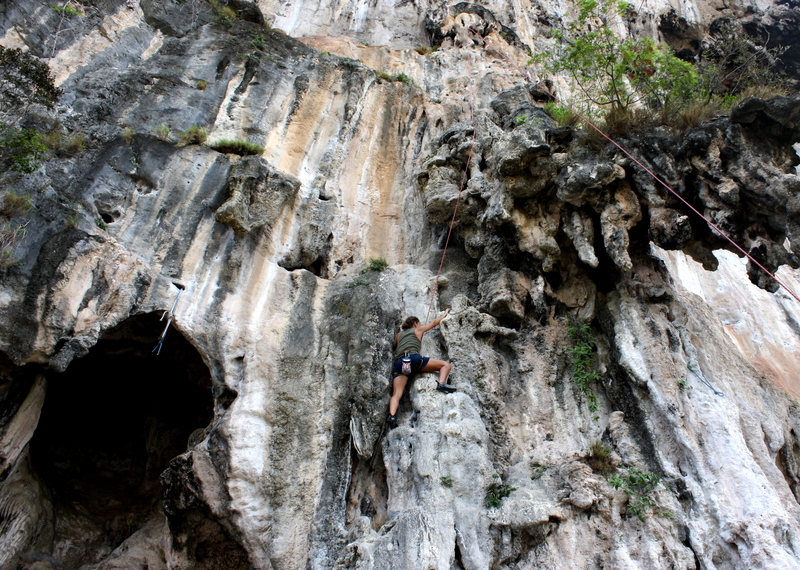 Rock climbing on Railay Beach was one of the most fun days I have had here. It truly challenged my mind, my body and my spirit and I have had a huge smile on my face ever since. I would definitely recommend it and when I make it back to Krabi someday, maybe I’ll do the full day. Congrats on making it to the top! I’d love to try this the next time I’m in Krabi! I would definitely recommend it. It was so incredibly fun and challenging. Definitely a nice break from soaking up the sun on an island!